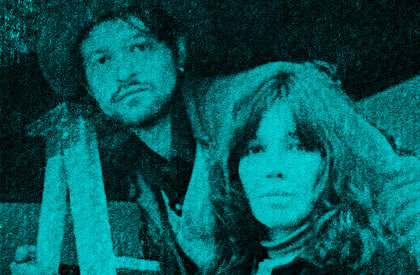 At the beginning of their collaborative novel, Piccolo Mondo (1998), authors Angela Bowering, George Bowering, David Bromige and Michael Matthews declare that the 1960s began in 1963 and ended in 1973, though they do not say where. That their book is set in Vancouver suggests that it is Vancouver they are talking about. So what happened (or did not happen) in Vancouver that made the sixties late? And when, if at all, did they end? The authors’ declaration is not new, for it has been said many times – from sources near and far — that the sixties began with the assassination of United States President Kennedy (November, 1963), or the Beatles first appearance on the Ed Sullivan Show (February, 1964), and ended with the Manson Family killings (August, 1969), or the Woodstock Music and Art Fair (August, 1969), or the Altamont Speedway Free Festival (December, 1969), or the resignation of United States President Nixon (August, 1974)... The point being that these events – both horrific and affirmative – were external to Vancouver, occurring as they did in the U.S. The point could also be made that the U.S.-dominated mass media had, by 1960, convinced the world that whatever was happening in New York, California, and Washington, DC, was everybody’s experience, and that for a village like Vancouver to have integrated these experiences confirmed not only the power of the U.S. media but the city’s entry into the modern world — a world where decades no longer began and ended with zeroes and nines, and where the local had more to do with paper than pen. 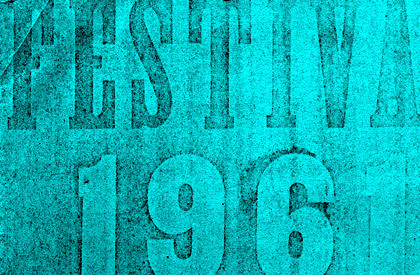 If one were to guess when the sixties began in Vancouver — and one guess is as good as another — it would have something to do with the first Festival of the Contemporary Arts held at the bucolic tree-lined campus of the University of British Columbia in 1961, a three-day affair featuring dancers, poets, musicians and visual artists, mostly from the United States. On the occasion of the fortieth anniversary of May, 1968, the Morris and Helen Belkin Art Gallery at UBC mounted Idyll: Three Exhibitions — one of which featured Radical Rupture (2005), a work by Holly Ward (b.1972). 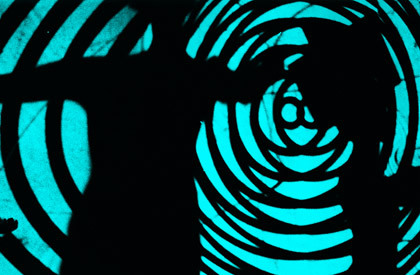 In a room outfitted with plush carpet and beanbag chairs, Ward’s installation includes an audio recording of a 1967 lecture by Herbert Marcuse and, projected on a screen, a black ground of painted tin foil, behind which the artist stood in dark clothes and white gloves, holding a pin. 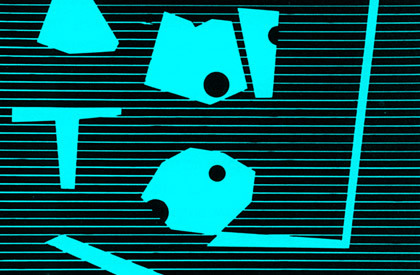 As Marcuse reads from “Liberation from the Affluent Society”, an essay that asks us to consider a “qualitatively” different way of being in the world (in order to transform it), Ward pricks the ground with holes, creating what resembles a starry night sky. Halfway through the lecture the stars begin to disappear, in reverse-order. In considering this piece I am reminded how the sensibilities that announced themselves during the first Festival of Contemporary Art were already in play, having emerged in the thirties, forties and fifties like pricks of light from behind their own black ground. This ground, an amalgam of old world British values (from what constitutes a work of art to how to blow one’s nose), remained more or less static since the end of the Second World War, much like Vancouver’s building stock, until the early-1980s, when the provincial Social Credit government announced, via Expo 86, that service and technical industries, not primary resources, would provide Vancouver its engines for the future. 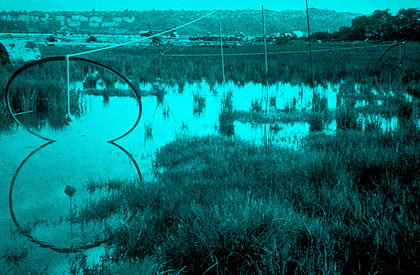 The 1961 Festival of the Contemporary Arts, instigated by UBC Fine Arts Department head B.C. Binning, was Vancouver’s first attempt at an integrated artistic environment. But integration – the kind that Binning and his colleagues had hoped for — would not occur until the 1964 Festival of Contemporary Arts. Nicknamed “The Medium Is The Message”, the ‘64 festival, conceived by Iain Baxter, Arthur Erickson, Helen Goodwin and Takao Tanabe, and organized by architect Abraham Rogatnick, bore the influence of McLuhanian communication theory and featured “the first multi-sensory public happening in Vancouver.” As pin-pricks, the ‘64 Festival helped to form the first artistic constellation in Vancouver’s sixties universe. Another occurred the following year, in 1965, with the opening of the Sound Gallery. The Sound Gallery, located at West Fourth Avenue and Bayswater Street, began as a storefront painting and rehearsal studio leased by eighteen-year-old art student and percussionist Gregg Simpson, but quickly evolved into a public venue, one that behaved similarly to The Cellar at East Broadway and Kingsway, a jazz bar started by Al Neil in 1956. What both spaces had in common, then, was an expanded artistic program located not at a university campus or a museum but on an urban retail strip. 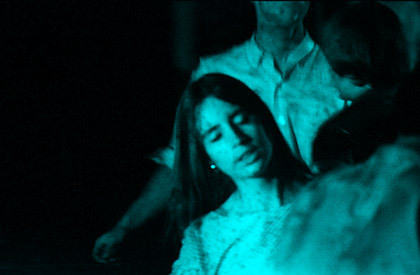 However, while the Cellar focused on jazz, theatre and literary readings, the Sound Gallery was home to a more abstracted program, where poet Judith Copithorne, as choreographed by Helen Goodwin, floated from the ceiling, her body awash in images devised and projected by David Orcutt and Sam Perry; where musician Al Neil, by then playing in a trio with Simpson and bassist Richard Anstey, would suddenly push back from his piano and recite a found or improvised text. Three months after the Sound Gallery’s first public performance, Perry and Goodwin secured a larger venue downtown, on Seymour Street, called the Motion Studio. 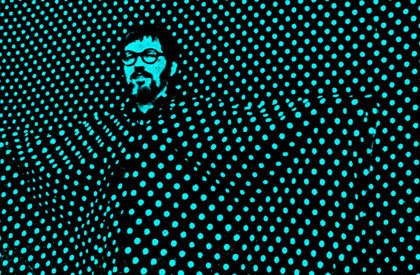 The success of the Motion Studio, coupled with Perry’s 1966 magnum opus the Trips Festival, excited interest among older artists such as Victor Doray and Jack Shadbolt, both of whom were friends of Binning, all of whom were friends of Rogatnick and Alvin Balkind, whose New Design Gallery (Vancouver’s first contemporary modern art gallery) provided a similar though less rambunctious function after its relocation from West Vancouver to West Pender Street in 1958. Indeed, it was artists and architects such as Shadbolt and Rogatnick who brought Goodwin and Perry, et al., to the attention of the Canada Council for the Arts, whose David Silcox travelled to Vancouver to witness for himself these new and convergent forms. A short time later, in 1967, the Intermedia Society was launched and a three-storey building at 575 Beatty Street secured. It was in this building, filled with video equipment and printing devices, that the new art would be made. This integrated interdisciplinary activity was very much in the spirit of what the Festival of the Contemporary Arts had hoped to foster when Binning and his colleagues conceived of it in the late-1950s. That the Sound Gallery asserted itself alongside other retail storefronts was a bonus, an indication that this mixing of forms was similar to what the nearby florist was doing when adding Bowen Island salal to bouquets of English roses, or the butcher who sold hibachis to families wanting to cook their meat on beaches. 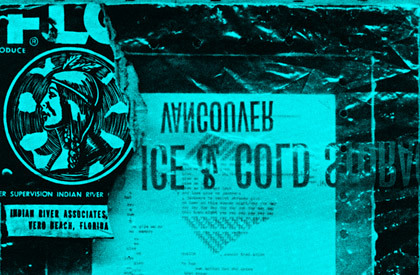 In economic terms, the Sound Gallery provided a diversified program, one open to hybrid forms that had not yet announced themselves — or if they had, were not interested in presenting themselves in the way flowers and meat had been sold. 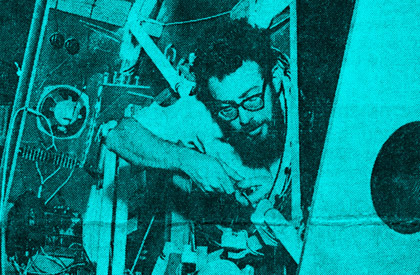 The establishment of the Intermedia Society marked an important moment in the development of a Vancouver art and the beginning of an artist-run culture that continues to this day. That said, no current Vancouver artist-run centre looks or behaves like Intermedia did during its five-year existence. So what was Intermedia, and why is it so important? Rather than answer that, let’s look back at those first almost indistinguishable pricks of light. And in doing so, focus on the city’s writers — and writing. It could be said that modern Vancouver writing began in two places: atop the bluffs at UBC, with English professor Earle Birney, and in a seaside shack at the city’s eastern edge – the Dollarton home of ukelele-playing Malcolm Lowry. But the distinction does not end there. Although both men were known for their adventure writing, Birney’s best-remembered poems — the silky smooth “David”(1940) and the thoroughly modern “Bushed”(1951) — take place in mountains, on the vertical axis, while Lowry, known for his jagged-wave prose style, set his masterpiece at the base of a volcano, or in the case of his first novel, Ultramarine (1933), at sea level, on the horizontal plane. 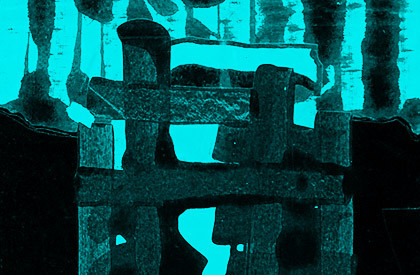 In temporal terms, what Birney was doing in the forties and fifties had little in common with the first iteration of UBC’s TISH poets (1961–1963) — but the same could not be said of Lowry’s Dollarton successor, the musician, artist and writer Al Neil, whose bricoleur approach to music, sculpture and text had much in common with Lowry’s “Through The Panama”(1954), one of Vancouver’s first examples of collage fiction. Apart from a distinguished writing career, Birney’s legacy is also institutional — the creation of the UBC journal Canadian Literature and the impetus behind the university’s Creative Writing Department, a ‘success-oriented’ program that eschews experimentation in favour of workshops and, more recently, directing students to agents and big house publishers. Oddly enough, the more adventuresome literary activity during Birney’s tenure was taking place at the other end of the English Department, under the tutelage of Warren Tallman, an American who had arrived at UBC in 1956. Tallman, a promoter of Donald Allen’s The New American Poetry: 1945–1960 (Grove, 1960), brought with him an enthusiasm for the projective verse of Charles Olson, as well as the writings and teachings of Robert Creeley and Robert Duncan, to name a few, all of whom read and lectured in Vancouver in the early-60s (some through Tallman’s invitation, others at the request of the Festival of the Contemporary Arts). These visits were crucial in the establishment of a modern urban literature, providing inspiration to student/poets such as George Bowering, David Cull, Frank Davey, David Dawson, Gladys Hindmarch, Lionel Kearns, Daphne Marlatt, Jamie Reid and Fred Wah, most of whom (with the exception of Cull, Kearns and Marlatt) went on to form the first TISH editorial in May 1961. Although dismissed by their more ‘perceptive’ Canadian contemporaries, TISH, with its emphasis on the ‘proprioceptive writer (the writer who sees “the surrounding world in the midst of himself as subject”, with an emphasis on the local), marked a critical moment in modern Vancouver literature, one that distinguished its writer/editors from proponents of an aesthetically-unified national program. However, by the mid-Sixties, the TISH founders began leaving the city in pursuit of teaching jobs (or, in the case of Reid, to devote himself to social work), an evacuation that, on the surface, could be seen as an abandonment of the local in favour of a more participatory relationship within the CanLit mosaic, behaving less as free radicals than as institutionalized professor-poets, in the way Birney operated at UBC. To suggest that their exodus left a void in the city’s literary scene would be true if one believes that college and university positions confer artistic validation – an attitude not held by the writers associated with Intermedia. In a recent essay, Abraham Rogatnick discusses the twentieth-century development of Vancouver’s transportation infrastructure in relation to the development of a local arts scene — how, with the advent of the automobile and a public street car system, the city’s “gridded townships were soon incorporated as neighbourhoods within the municipality of Vancouver.” Rogtanick also mentions the importance of bridges; how they too contributed to this linkage. Indeed, while the Lion’s Gate Bridge (completed 1938) allowed Binning to build one of the city’s first modern houses in the hills of West Vancouver, it was the Iron Worker’s Memorial Bridge (completed in 1957) that allowed Al Neil to move to Dollarton and still have access to the city’s burgeoning cultural scene. 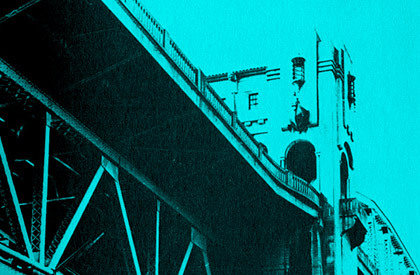 The significance of roads and bridges alludes not only to McLuhan, whose writings were rooted in the infrastructural theories of Harold Innes, but to the emerging literary milieu — a case in point being the TISH poets, who, according to Maxine Gadd, “were sending bridge poems to one another.” Of course the same could also be said of Gadd, whose own interest in bridges, such as “Bridge Poem” (1964), “all gaped and gapped,/ the grand black crosses of the understructure,” alludes not only to the bridge as a physical necessity – leaving one part of the city for another – but as representative of a more spiritual transition, one aware of the unity between coming and going. Taken further, unity could be construed as the movement of one medium to another, the prospect of a convergent medium, and the practice that binds it. Like Al Neil, a trained musician who explored sculpture, collage and writing, Gadd wrote poems and sang — and in combining the two developed an extended vocal style that has led art historian Gail Tuttle to identify Gadd as one of Vancouver’s first performance artists. Gadd was among a number of younger writer/artists active in Vancouver in the late-1950s and early 60s. Some, like Gerry Gilbert (a potter who wrote poems, took photos and made films) and Roy Kiyooka (a painter who wrote poems, took photos, made films, and played music) migrated to the city as adults, while others, such as Gadd and Copithorne, spent parts of their childhood here. In his remembrance of Curt Lang, Jamie Reid talks of Vancouver arriving late to a beat scene that took off after the publication of Allen Ginsberg’s Howl (1955), recalling “beatnik joints” like The Black Spot on Dunbar Street, the Den on Harwood, and the Little Heidelberg on Howe, as well as the bookstore salons of Binky Marx at Duthie’s on Robson Street and, across the road, Doug and Hannah Kaye’s. In her own recollection of the times, Copithorne, one of the earliest local practitioners of concrete poetry, mentions a budding interest in cannabis, Eastern mysticism and the presence of socialist organizations like Vanguard Books at 1208 Granville Street, and the influence they had not only on the way work was conceived but how it was produced. An example could be found in the hard-drinking Martime poet Milton Acorn, an evangelical Marxist (as opposed to bissett’s marijuana shaman) who initiated a reading series at a former West Fourth Avenue retail outlet known as Advance Mattress. Another can be found in the creation of magazines like bissett’s blewointment and Gilbert’s Radiofreerainforest. While the TISH newsletter was a clean and neatly-typed affair, filled with poems of a 1950s modernist bent, blewointment’s first issue emphasized the concrete nature of the written language, not just in its phonetically shortened form (“reveald”) but through misspellings (“wgich”, “abstracion”). Although the poems in blewointment also had a localized modernist sensibility, woven between them were drawings and collage elements made up of newspaper clippings and handbills, many of which (“wgich”?) were supplied by bissett. Later productions, such as Gilbert’s inaugural radiofreerainforest (December, 1968) were duplicated using multi-coloured inks. All three magazines were printed using mimeograph machines — TISH on a Gestetner (though the first few issues were done on Larry Kent’s off-set printer), blewointment and radiofreerainforest on Intermedia’s Roneo. Apart from seeing their own work in print, the TISH writer/editors appeared more focused on a dialogue with American poets, whose influence they had drawn upon, while blewointment, which also began with local contributions, grew outward with each issue, ring by concentric ring, adding but rarely subtracting. Writers such as John Newlove published in both TISH and blewointment, as did Diane diPrima; blewoinment was the first to publish Central Canadians Margaret Atwood and Michael Ondaatje. But to limit the conversation to literary writers would diminish the contribution of blewointment and radiofreerainforest to the interdisciplinary scene. For these magazines were less literary outposts than meeting places for two-dimensional work of all kinds — more collage in their layout than right-angled exposition, each representative of a new kind of artistic expression, yet each contiguous with early forms of literary activity, such as Lowry’s “Through The Panama” and Neil’s textual collages. 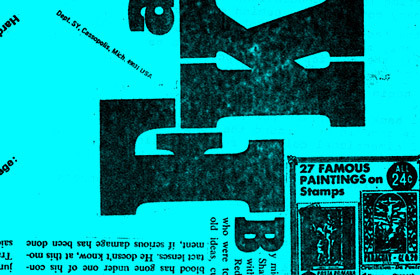 In the spring of 1968, Michael Morris, a painter and founding member of Intermedia, received a letter (care of the Vancouver Art Gallery) from artist Ray Johnson, founder of the New York Correspondence School. Though it does not say so explicitly, the letter came in response to a reproduction of a painting Johnson had seen of Morris’s “The Problem of Nothing” (1967), reprinted in Artforum. The content of the single-page largely typewritten letter provides information on a number of people named Ray Johnson, as well as an invitation to meet the sender next time Morris is in New York City. 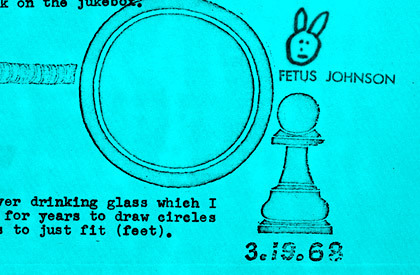 There are drawings, one of which is Johnson’s trademark bunny; a tracing of Johnson’s silver drinking glass; a Xeroxed reproduction of a three-dimensional chess pawn; a stamp declaring that “JOHN WILLENBECHEAR HAS BEEN DROPPED FROM THE N.Y.C.S”; and a reproduction detail of Morris’s painting. What resulted from Johnson’s letter was a new wave of epistolary activity involving a number of Vancouverites such as Morris, Glenn Lewis, Eric Metcalfe and Gary-Lee Nova, in addition to the N.Y.S.C.’s international network of correspondents. Like the traditionally non-literary blewointment and radiofreerainforest, these letters had little in common with Richardson’s Pamela (1740), or even its parody, Fielding’s Shamela (published the following year). Indeed, nor were these letters collected in book form but tacked to kitchen walls, tucked into portfolios, archives, free to scatter like petals on a wet black bough. The following year Johnson’s collages would play an important role in an exhibition curated by Alvin Balkind at the UBC Fine Arts Gallery, entitled Concrete Poetry. Opening in August, 1969, Concrete Poetry featured the work of over sixty individuals, an unprecedented convergence of literary and visual artists the world over, and perhaps the most enduring local challenge to the question of who and what is writing — and when and where is visual art. The creative activity of literature now concentrates not upon explaining and expressing to men those “great understandings”, but rather it is used as a means of locating the human consciousness in time and space; and culture, the creative arts, now competes with science to provide the totems of our awareness deserted by religion. A metaphor: in the vast emptiness of the Australian desert, aboriginal man locates his center with a single pole, thrust into earth. Thus the poem, concrete. A bold proposition, to be sure, especially when read against the emergence of another literary formation, the Georgia Straight Writing Supplement, that same summer. Born from the ashes of consecutive TISH editorial regimes — such as Georgia Straight co-founder Dan McLeod, who took over TISH after David Dawson, and Stan Persky who succeeded McLeod — the GSLS, guided by Persky and filmmaker Dennis Wheeler, published a range of local and American literary writers, such as Georgia Straight co-founder Milton Acorn, bissett, Robin Blaser, Gladys Hindmarch, Jack Spicer and George Stanley. But again, like TISH, an unlike blewointment and radiofreerainforest, the GSLS held to generic notions of literary writing – what Wallace alluded to when he spoke of the explanatory and the expressive. Indeed, what the GSLS published was work consistent with its politically engaged parent, which by then had emerged as a critique of local issues, such as a hippie-busting mayor, and, on the international front, U.S. military involvement in Vietnam. To suggest that the GSLS was a vanguard operation would be ignorant of the Concrete Poetry exhibition’s achievement, for not only did the latter confuse the line between written and visual categories, it transcended them altogether.